Stitchy Saturdays – Fame at last! Last week, a stitchy friend contacted me to say this blog is featured in the latest issue of World of Cross Stitching Magazine (issue 178), which she had just received (she’s a subscriber and gets it a week earlier than it hits the shops). 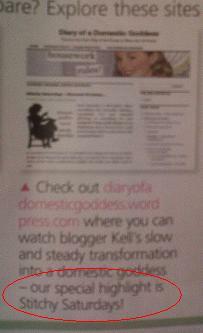 Well, today I got my own copy and there it is, right on page 28, in the “Websites we love” section! And on the stitchy side of things, I’ve made two little finishes this week. 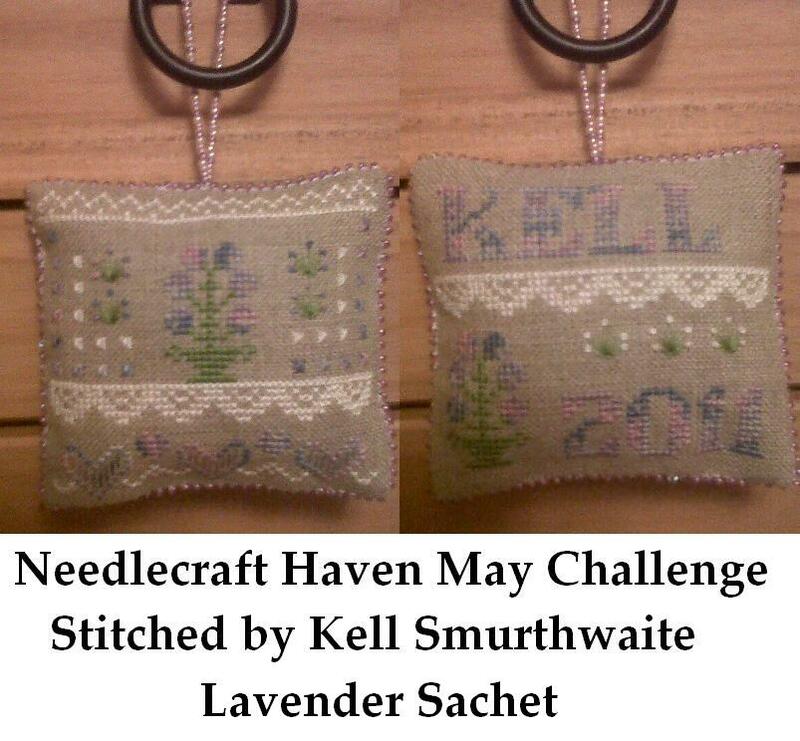 The first is the May Challenge for the Needlecraft Haven forum. It’s a gorgeous little design from Sablaise and I LOVED stitching it on 32-count raw linen in variegated purple floss (DMC 4215) with a lovely soft green, and white for the lace. I then used parts of the design on the reverse with my name and the year, made a little pouch to fill with dried lavender and popped it inside with some soft toy stuffing. I edged it all in purple glass seed beads. It smells heavenly and looks rather pretty by my bed to help me to sweet dreams! The second finish is my first attempt at something hargander-ish. Although it involves absolutely no cutting (I’m terrified at the thought, but I will work my way towards trying it sooner or later, I promise! ), it’s my first attempt at satin stitch, Kloster blocks and those swirly-whirly woven roses. on reflection, I wish I hadn’t stitched the entire thing in a hot-pink variegated floss as it’s just a bit too full-on-pink-overload (the fabric is 28-count hand-dyed evenweave in a lovely spring green), but it was fun to do and I might be tempted to stitch this design again using several shades in softer tones. You can find the design at Mankaminta’s blog HERE. Have you tried anything new, stitch-wise, this week? Or finished any pieces? If so, I’d love to know, so please leave a comment below with a link and join my Stitchy Saturdays! This entry was posted in Crafts, Freebies, Memes, Pastimes, Stitchy Saturdays and tagged Cross Stitch, Cross Stitching, Domestic Goddess, Freebie, Memes, Stitchy Saturdays. Bookmark the permalink. I think the pink no cut hardanger piece looks fab, but then I do like pink. I was also very nervous the first time I cut, but it is a lot easier and less scary then it first appears. Keep up the good work Kell. Love the spider web roses as well they are fun to do .